Deputy Prime Minister Nick Clegg spoke at the Northern Dinner of the Community Security Trust in Manchester on Thursday 3 November 2011. “I never fail to be inspired by the Jewish community. The depth of your religious traditions, spanning thousands of years. Your rich cultural heritage, your contribution to British life. Indeed the history of Jews in Britain is, itself, a history of some of the greatest figures in British arts, education, business and politics. And when you look at the Jewish community today it is difficult not to be impressed. Whether at your pride in being part of a community that generates so much warmth, kindness and generosity. Your charitable work. Your volunteer networks – people who work tirelessly towards the goal of Tikkun Olam. And your phenomenal capacity to work in coalition: Orthodox, Reform, Liberal, Masorti…I’d be grateful for any tips. “Tonight we are here to pay tribute to the CST. It is profoundly disturbing that some people still wish to harm the Jewish community. By vandalising Jewish buildings, graffiti-ing Jewish gravestones, even attacking Jewish people. 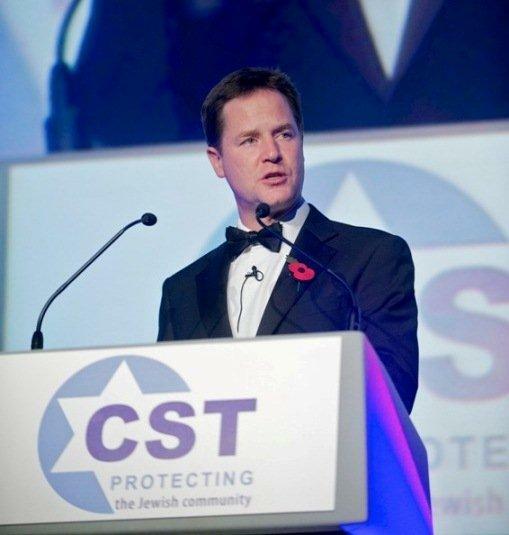 The CST stands up to those people – you are the protective cloak over communal Jewish life. Whatever the weather, whatever the time, CST volunteers will be at every event, outside every building. Providing reassurance, deterrence. Providing that vital link with the local police – and Manchester is an excellent example of that partnership.